Maxi Health Research brings you the only kosher certified Kyolic® galic tablets available! The exclusive aging process used eliminates garlic odor and harsh side effects. Moreover, it contains various antioxidant properties. Kyolic® whole clove garlic is grown in specially prepared, organically rich, and uncontaminated soil. Furthermore, no pesticides are used in growing Kyolic® garlic. Kyolic® is the first garlic supplement to offer standardized levels of SAC (S-Allyl Cysteine). SAC represents many important, valuable, stable and safe principles of garlic. 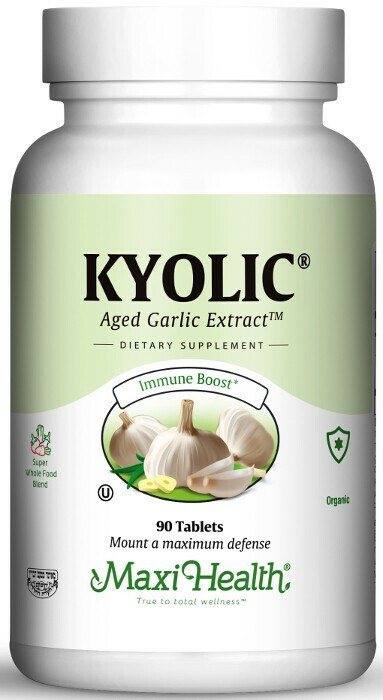 Get Kosher Kyolic® Aged Garlic Extract™ Tablets, only from Maxi Health! Take two (2) tablets twice daily with a meal. Other Ingredients: Cellulose, starch, silica, and magnesium stearate. Kyolic® and Aged Garlic Extract™ are trademarks of Wakunaga of America, Co., Ltd.
My son, age 10 was complaining that his feet hurt him. He was skinny, not eating well, did not have much energy. We bought Kyolic Garlic Extract and gave it to him twice a day. He looks healthier and is showing improvement in school. His other siblings want to take it also. Thank you for this product. As autumn approached, my children developed runny noses. A nutritionist told me to give them Maxi Kyolic 400 and Vitamin C and within a week we saw major results. When my throat hurts it is very uncomfortable. When I can't sleep because of it at night, I get out of bed and take Maxi Kyolic 400. It relieves the pain even as I swallow it! My husband used to get sick often with all different ailments and had poor stamina. Since taking the Kyolic tablets, he is much healthier. My 4 year old son used to have a lot of colds and ear infections. Now, since he takes Kyolic he stopped having colds and ear infections. It's really like magic.